Geoff Crammond, now he knew how to design a Formula 1 game. Nowadays though the days of the A, Z, < and > keyboard set-up are long gone, old Geoff's skeleton is crumbling in my attic and the racing genre is ruled by Codemasters, also long changed since the days of Dizzy the Egg. All the DIRTs, the GRIDs and the TOCAs have combined to put Codemasters firmly on top of the pile. 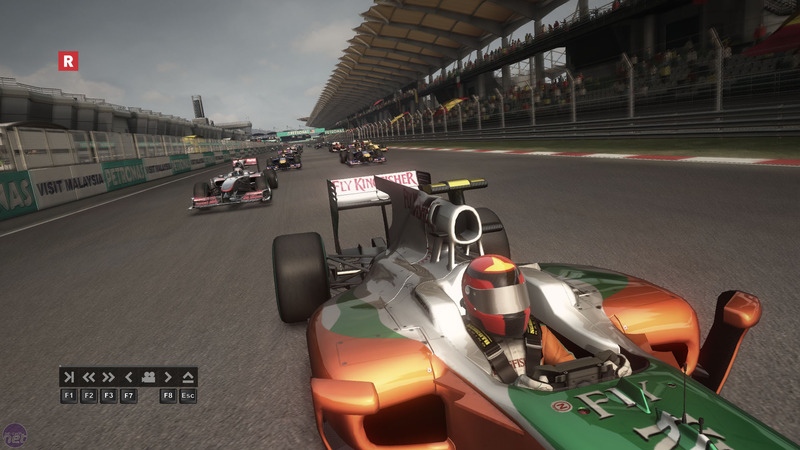 With F1 2010 though, Codies is taking on an altogether different challenge, to recreate not just a race and some powerful vehicles, but also the whole atmosphere and world of the F1 scene. It’s also got to deal with racing's most fanatical fanbase (more on that later). 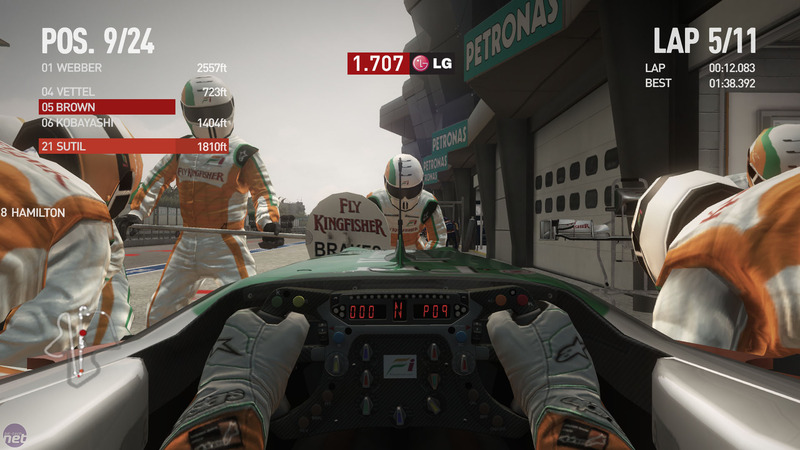 In recent times, licensed F1 games have been of the arcade variety and, therefore, have been lightweight and rubbish. Going in a slightly different direction, Codies has taken it’s successful formula of 'realistic arcade' action and just cut out all the dune buggies and things like that for F1 2010. The likes of Travis Pastrana have been replaced with F1 press conferences and clean, conspicuously un-gnarly trailers. The first thing you'll be presented with upon entering the game is a few options to define just what kind of player you are. These are delivered in one of the new 'media circus' elements, the press conference. Clare Balding (or someone very similar) stands up and asks you a few basic questions. The rest of the crowd seem to be mutes, because every time you return to face the media, only Clare stands up to grill you. I say grill, but it's really just “You did well, didn't you?” or “Is your co-driver nervous of your success?” constantly. The whole press element is devoid of any excitement and sadly adds nothing to the game. With this out of the way, the only thing to really differentiate F1 2010 from previous Codies racers is the experience of being in the pits with the engineers. Here, at least things have a point. The chief engineers for your team (we chose Force India, for the amusement value) run through your options, which include all manner of technical tweaks that can, for non-petrolheads, be thankfully ignored. Getting stuck in and covering yourself in grease can help shave a few picoseconds off your lap times and proves crucial on the harder levels, but newcomers can for the most part just stick to the recommended set-ups. Once you've done all this, the logical next step is to get out onto the track and hurl your flimsy metal shell-on-wheels either into a wall or over the finish line in triumph. As you'd expect, the driving engine is robust and, to veterans of Codies racers, familiar. At the easiest difficulty level there are numerous driving assists to help you fail at spinning off the track, such as an ideal driving line, braking help and traction control assistance (perhaps the most useful of the three), plus the usual automatic or manual gears options. As you get better, you'll be able to turn these off and face more challenging (read: quicker) AI racers, and you also get less of the now-obligatory Flashbacks, which have been around since GRID. These, for the uninitiated, are second chance opportunities to go back in time a few seconds, so spinning into the gravel on the last corner of the race doesn't necessarily mean you've screwed up your chances of winning. Hit F12 when the instant replay starts and there, you've got another go! Brilliant and still indispensable, regardless of how good you think you are.